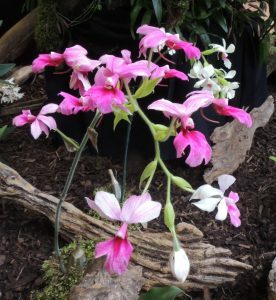 We had two clones on Calanthe vestita on our London Display. This species is a terrestrial found across South East Asia, form sea level up to 1000m, and requires a really dry winter rest after the leaves have turned brown and dropped. We put plants up on the electrical control box in the classroom section to make sure it is not watered by mistake. The species was loved by the Victorians as it flowered with no leaves and so was tolerant of being brought into dry conditions in the parlour. We grow plants in pots and repot every year as new growth commences though we are careful not to water too heavily until plants new growths are well established. We have found the species easy to raise from seed. 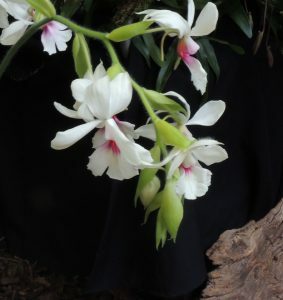 I thought this orchid very beautiful quite unlike ‘usual’ orchids as it does not have waxy leaves and has delicate hairy stems more like a bedding plant. As this orchid doesn’t have leaves how does it photosynthesise? Copyright 2006 - 2012 The Writhlington Orchid Project. All Rights Reserved. No content is to be reproduced or republished with prior written permission. Website Designed and Coded by Daniel Groves.